This class is an excellent preview of the exclusive content coming for our members. A 10-class Shoulder Short series. People want shorter videos, they get it on the membership site. These are 10, 20-30 minute videos focusing on releasing your upper, back, neck and shoulders based on the classic Upper Back, neck and Shoulders 1 & 2 videos for when you have less time. We have been filming them all week. Almost 5 hours of new content divided into 10 bite sized pieces for when you only have a little time during your busy work week. This week we will begin to focus on a new mantra, Asato Ma from the Brhadaranyaka Upanisad (1500 BCE). Om asato ma sad gamaya: lead me from untruth to Truth. In this stanza of the mantra we are moving from untruth (asat)towards truth (sat). Each one of us lives through a cycle of suffering whereupon we are ignorant of our True Nature, this mantra helps us to realize the everlasting source within us, which some call the atman. Over the next few weeks are are going to explore the story from the Brhadaranyaka Upanisad which proposes that it is a mantra that can take us to our internal, self-effulgent essence. In our creation story, the world is manifest in the cosmic ocean from purusa, the subtle underlying source present within all things. The manifestations that arise out of this cosmic ocean of purusa are known as parkrti, manifest reality. On the night of Brahma, out of the ocean of consciousness, seeds ripen, atoms split, time and space are born. Eventually the earth and all the substances of the universe in all its diversity are created. As prakrti continues to materialize, it becomes denser and denser, further and further removed from its original source. Eventually you can not even recognize its luminous vibration or purusa. This is the veil of Truth to untruth known as maya. Soon, we too see only the veil, and not the Truth that is behind it. Through our practice of yoga, we are able to see through the veil of maya (illusion) and recognize the effulgent source (purusa) at the heart of all things. Yoga Asanas/Postures: Neck and Shoulder Release, Marjaryasana/Cat Pose, Dharmachakra = Mudra with Asatoma Mantra, Adho Mukha Svanasana/Downward Facing Dog, Cow’s Face Arms/Gomukhasana Arms with a side bend, Revolved Chair Pose/Parivrtta Utkatasana, Shoulderstand, Fish Pose/Matsyasana, Cow’s Face Pose Twist/ Parivrtta Gomukhasana, Cow’s Face Pose/Gomukhasana, Savasana/Corpse Pose. Previous post: Why is “legs up the wall” good for the immune system? 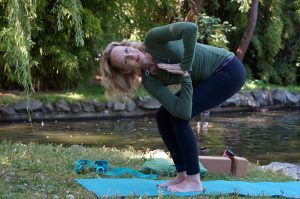 Next post: How can yoga help rebuild bone mass?